They had gone to war and fought and many died defending a country that had reneged on its Constitution and treated them illegally as second-class citizens, but in defending America, ensured greater freedom for us all. It took the government 70 years to recognize it. 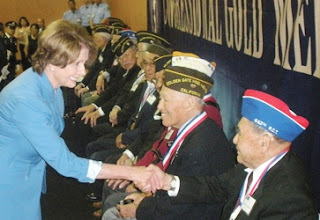 Pelosi’s comments came during a ceremony awarding veterans of the 442 Regimental Combat Team, the 100th Infantry Battalion and Military Intelligence Service (MIS) of the Congressional Gold Medal, the highest civilian award presented for outstanding achievement. Held at the Japanese Cultural & Community Center in San Francisco, Pelosi’s home town, the observance like similar ones held in San Jose and Sacramento, was for veterans who could not journey to Washington D.C. to receive their medal last November. In addition to Pelosi and congratulatory remarks from President Barack Obama in a video, the event included welcoming remarks from retired Judge Brian Yagi, president of the National Japanese American Historical society, and James Cook, commander of the 91st Division U.S. Army Reserve. Many of the veterans had already passed away and were unable to receive their Gold Medal, so their families were presented them. A somber moment of the event came when the crowd in the packed hall silently watched a screen upon which the photos of veterans killed in action in World War II were displayed. In 1942 just two months after the attack on Pearl Harbor, President Franklin D. Roosevelt signed Executive Order 9066, calling for the expulsion and detention of 120,000 Japanese American citizens along the West Coast who were judged to be a threat solely because of their ancestry. Stripped of their citizenship, jobs and property, men, women and children were removed to barbed-wire-enclosed internment camps in desolate desert regions of the Southwest. Soldiers of the MIS served in the Pacific Theater of the war and often acted as translators, deciphering Japanese transmissions and interrogating prisoners. They also helped American officials deal with the public in a destroyed Japan after the war and were vital in reconstruction efforts to rebuild the nation, today one of America’s closest allies. Acting as an interpreter for the 187th Regiment, Hanamoto helped military officials clear and repair the shattered country. Asked why the 442nd was such a great outfit, veteran KEN NIHEI (86), said comradeship played a part. Many of the soldiers had come from the shared internment camp experience. “I had been interned at Camp Topaz,” Nihei noted. Originally from Maui in the Hawaiian Islands and now a resident of San Francisco, Endo was wounded by shrapnel in his right leg and foot in Italy in June 1944 just two days before the Allied capture of Rome. He pointed to where the wounds on his leg are located, for which he still receives therapy at the age of 89 and walks with a cane. Endo nearly had his right leg amputated and spent 15 months in a hospital. He resumed a civilian occupation after the war repairing office machines. The event included an invocation by Chaplain Omar Doi of the Golden Gate Nisei Memorial VFW Post 9879 and a closing prayer by the Reverend Ronald Kengu Kobata of the Buddhist Church of San Francisco. The Pledge of Allegiance was led by the Eagle Scout Jason Chooey and Boy Scout Troop 58, and the National Anthem by Richard Kishimoto, of the San Francisco Nikkei Lions Club, who also led the audience in singing God Bless America. Presentation of the colors was by the U.S. Army Color Guard led by Master Sergeant Stanley Kamiya of the U.S. Army Reserve.